Every photographer has a toolbox of camera accessories that are heavily used for photography. While some photographers have a large array of accessories for every type of situation and need, others only buy what they feel is necessity for their photography work. In this article, I will provide some detailed information about what accessories should be in every photographer’s bag – I call it a “must-have” list. As soon as you buy a camera, you buy a camera bag, because you want to protect your investment and easily transport it between locations. 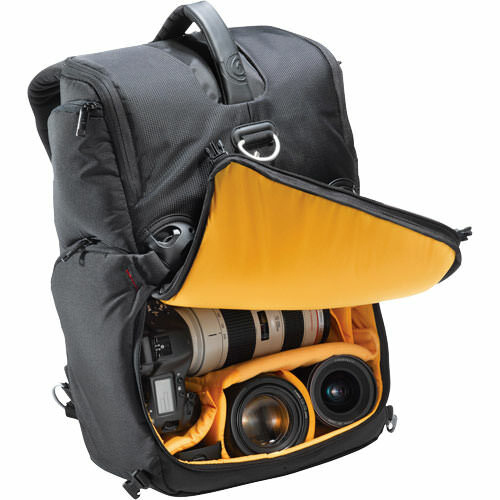 But choosing the right camera bag is not always easy – there are so many different bags out there, that it gets frustratingly difficult to make the right decision. Often times, people end up buying a small camera bag, only to replace it in a couple of months with a different one, realizing that they need more room for their camera and lenses. This happens all the time and it also happened to me! I got my first Nikon D80 DSLR, thinking that I wouldn’t spend a penny more on an already expensive camera. I bought a compact camera bag that fits the camera and a couple of lenses and thought that I was good to go. Eventually, I ended up buying another lens and extra accessories and my bag was too small to accommodate everything. So I had to go and buy another camera bag with more room. Instead of wasting your money like this, you should buy a good camera bag from the get-go. I personally prefer a backpack, but some people like the convenience of using sling-bags and shoulder bags. It is a personal preference and you should definitely try before you buy…a local camera store is a great place to start. My personal favorites are LowePro and Kata bags, specifically LowePro Pro Runner 300 AW and Kata 3 in 1 Sling Backpack. An extra battery is an indispensable accessory that will definitely come in handy, especially when traveling. If you do not already have an extra battery, you should definitely buy one before your next trip or vacation. One more thing – batteries do not last long when you shoot in cold temperatures, so be prepared for a short battery life if you are shooting in freezing conditions. Although many DSLR cameras come with a plastic protector for the camera LCD, I still highly recommend protecting the rear LCD with a regular screen protector. Sometimes dust gets in between the LCD and the plastic screen protector and scratches the LCD. A DSLR camera with a scratched LCD is not going to have a good resell value, so that’s the first thing you should do to keep it away from scratches. LCD protectors work great and you can find those at almost any size to fit your LCD. Once you protect it, don’t forget to put the plastic protector back in place, if you have one. The neck straps that come with DSLR cameras are very uncomfortable. When you carry a heavy camera+lens combo on your neck, a standard camera strap can leave painful bruises on your neck, after just an hour or two of wearing the camera. 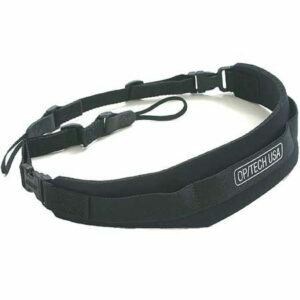 Gladly, there are many excellent neck straps available today such as Op/Tech Pro Loop Strap that I cannot live without. It is soft, very comfortable and can easily hold my heavy Nikon D700 + battery pack with a large lens such as Nikon 70-200mm VR II without any problems. Another super-popular camera strap is the RS5 Strap from Black Rapid, so check it out as well. Dust and dirt in front of the lens element reduces lens contrast, resulting in cloudy-looking images. Therefore, you should always keep lens front and back elements clean at all times. There are plenty of different brands to choose from and any of the optical solutions should work fine. Check out some cleaning kits from Nikon and Zeiss. The Giottos Rocket Blower is a miracle when it comes to blowing off dust from your camera gear. It only costs ten bucks, but this is one tool that you will be carrying with you in your camera bag at all times! It helps me keep my lenses clean and it does a really good job blowing off dust from the camera sensor when I’m traveling. Give it a try and you won’t regret it. A good, sturdy tripod is a must-have for low-light, night and landscape photography. Don’t buy cheap plastic tripods that can easily break – you do not want to put your expensive DSLR equipment on a crappy tripod. Always make sure that the tripod you are buying can handle at least twice more weight than your DSLR and lens. I have heard plenty of horror stories about expensive DSLR cameras falling off from crappy tripods! The best tripods are made by Gitzo, but they are expensive (starting from $400 and up). Manfrotto also manufactures very good tripods and you can buy tripod legs and a head separately, or buy a tripod system. Some of the cheapest tripods are by Sunpak (priced under $100) and you can find them even in such stores as Best Buy. I have also heard that the Slik tripods are very good in terms of value and price, such as the Slik 700DX Pro. Don’t forget to grab a remote shutter release for your DSLR along with the tripod. You can easily cause camera shake on a long lens setup, even if you are using a sturdy tripod. When you work with slow shutter speeds, ever bit of vibration can cause your image to be blurry. A remote shutter release will let you fire your camera without touching it. Many of the entry-level DSLRs have infrared remotes that are very lightweight, compact and best of all – wireless. If you are shooting on a pro-level body, you will most likely have to buy a wired solution. Both Nikon and Canon have a good selection of remote shutter releases and I recommend getting one that supports “bulb” mode (more than 30 seconds exposure) with an exposure lock. Get used to buying a lens protection filter while buying a lens. If you do not already have one, definitely buy one as soon as possible. Not only do protection filters help protect your lens from accidental damage, but they also make it easier to clean lenses, especially when the front element of the lens sticks out in a round form. Although some photographers claim that filters degrade image quality, I have been shooting with filters for years and have learned that good filters almost do not affect image quality. Just buy good filters such as B+W or Hoya Pro series and forget about what everyone else says. If you are thinking about taking pictures of landscapes and architecture, a polarizing filter is another “must-have” accessory. I wrote an article on how to use a polarizing filter before and I highly recommend to check it out. Basically, a polarizing filter can reduce reflections from objects such as water and glass and can be used to darken the sky and bring out the clouds, making the scene look much more vivid. I do not recommend keeping it on your lens at all times, since a polarizing filter slows your camera down by reducing the amount of light that passes through it. Good tips! Just wanted to add a recommendation to the tripod list. I’ve found Giotto’s tripods, ballheads, and quick releases to have a tremendous value/quality for the price. They aren’t the quality of Really Right Stuff or Gitzo, but they are a good value for the beginner that doesn’t want flimsy plastic and can’t afford $300+. For about a year I’ve been using a GIMT9251 3 section aluminum tripod with an MH1301-656 ball head. The heaviest load I’ve used on it yet has been a Nikon D70 with external Quantum battery and 24-70mm f/2.8. I bet a D300 or D700 with vertical grip would still be fine but I haven’t tested that yet. Aaron, thank you for sharing valuable information with the rest of our readers. It is nice to know that Giotto has good tripods! I really love Giotto – it is a good company with lots of great products. Nice list. Very helpful. I have all of the above, except a good tripod. I bought a cheap one which is heavy and I rarely carry it for traveling (defeats the purpose of buying one). Have to save up some dough for a nice lighter tripod. I think the same thing applies to camera bags..they should be easy to use. Also, I read in one of your earlier posts that you would post about a comparison between the 35 mm 1.8 and the 50 mm 1.8. I have a 35 mm and it serves me well on my d90, but I love your pics on your 50 mm. Am curious about your thoughts on the same. SM, yes, a nice and lightweight tripod is a must-have tool, especially for landscape photography. The lightest ones are going to be made of carbon fiber. As far as the comparison between 35mm f/1.8 and the 50mm f/1.8, I was actually planning to do a comparison between the Nikon 35mm f/1.8 DX and the Nikon 50mm f/1.4G/D models instead. But one thing for sure, having used the 35mm f/1.8G lens for a week now, we fell in love with this lens so much, that my wife wants one for her food photography! Check out her latest post – the whole recipe was shot with a Nikon D90 and 35mm f/1.8 DX. It is a sweet setup and I love this combo. I would say that you do not need the 50mm f/1.4, unless you want to have better portraits with smoother bokeh. Love this website and I know have your list and I will do some price matching now. Nina, you are most welcome! Thanks for stopping by and dropping a comment! Tian 57, you are most welcome! I am upgrading my lens filters and need some help from your experience. It seems you prefer B+W filters. Are there any big upsides or downsides to slim or non slim filters? What do you do when you need to stack a polarizer on your UV filter? Do you keep them on your lenses all the time? Or rather when do you take off your UV filters? What about ND filters? Slim filters are good for ultra-wide angle lenses (less vignetting), but they are inconvenient to use. It is OK to stack filters if you use longer focal lengths (above 35mm), but not for anything shorter – you will see too much vignetting. Shooting against the sun with multiple filters might introduce too much flare as well. I leave UV filters on the lenses at all times, unless I use a polarizer – in that case, I remove the UV filter and only leave a polarizer. I use ND filters through a separate Lee Filter holder system, so I often leave the UV filter in place. I just found specks of dust on the sensor of my Nikon D5000. I tried to remove the dust with a Giottos blower and also cleaned it with a microfilter cloth. But,the situation is still the same. Please HELP !!! Shourya, why did you try to clean the sensor with microfiber cloth? The sensor should never be touched by anything but special brushes and wipes for sensors. The maximum you should be doing is blow air with the Giottos rocket blower at the sensor, keeping a safe distance so that the sensor is not touched. I didn’t know that the sensor shouldn’t be cleaned with a microfibre cloth and no 15 year old would :P. Well, I got a Giottos lens cleaning kit and after using the brush, guess what! All the dust cleared up. Shourya, I understand :) Sorry if I sounded to harsh on you! I’m glad that the dust is now gone. I am currently considering upgrading to a DSLR. I’m seriously considering the Nikon d5000. All of the reviews seem really good, and it seems like a good “starter” DSLR. Do you have any particular recommendations on a UV filter and a polarizing filter? I know you stated that you recommend B+W brand, but when I search on the B&W website, it returns overwhelming results. Any recommendations would be appreciated. Lydia, sorry for a late response. D5000 is an excellent choice to get into photography. In terms of filters, depending on the filter size of your lens(es), I would get the B+W MRC UV filter and a B+W Circular polarizer. Let me know what lens you are planning to get and I will give you exact links to the filters I recommend. Well, to start, I’m probably just going to stick with the one lens it comes with (AF-S DX 18-55mm). Once I have become more familiar with shooting with a DSLR, I may look into some other lenses. Thanks for your help! I’m so glad I came across this site, thank you for all your information. I have learned a lot from here as I am just entering the dslr world :) I am enjoying it so much. My question for you is concerning lens hoods. I see how it would not be a must have, but are they good? I’ve seen the round rubber ones that extend and the petal style. Seems like it would be a good investment to also help protect the lens and keep out glare? Thanks again. Mike, most lenses come with hoods. The size of the hood also depends on how a particular lens deals with ghosting and flares, so I would not just get a generic hood. What lens are you planning to buy a hood for? I always keep the hoods on my lenses for extra protection and to minimize flare, so yes, it is generally a good idea to have one on a lens. Thanks. I am planning on either the canon 50mm ef 1.8 or the canon ef 10-22mm. I had my eye on the 50mm f1.8 first for great indoor and portrait shots, but my friend is tempting me with his ultrawide for super cheap. Will the 10-22 still do good indoor and portraits/kid shots? Thanks again. Mike, well, both lenses serve different needs though :) The 50mm is a portrait lens and the 10-22mm is a wide-angle lens for landscapes and architecture. You can certainly shoot indoors and portraits with the 10-22mm, but forget about smooth bokeh with that lens…it can only be done with a telephoto or portrait lens like the 50mm f/1.8. Need to have some info, I have been using Canon 50D with almost 5 different lenses for tele/ wide/ portrait/ zoom etc. I am tempted to create portrait with black or white background. I know its been done in after labs, using Photoshop or other tools. I want to ask which tool specifically you recommend to have those work ? Yeah a Sturdy Neck Strap would work wonders for me at the moment. Currently the only camera that I am using right now is the Nikon D3S with the 70mm – 200mm VRII which is soo heavy, I call it a back breaker. Bryan, I totally agree with you – the D3s coupled with the 70-200mm definitely hurts my back! I recently shot a wedding with this combo and I got very tired quickly. One of the straps you mentioned earlier is the black rapid RS-5, there is an RS-7 out now and they are awesome. Something to get used to though is that with these straps the lens hangs out of the way, and is very comfy. I got a Black Rapid RS-7 R-Strap a couple weeks ago. I’m using it with the BRAD strap under my arm. www.blackrapid.com/Curve-Breathe I absolutely love this thing for a heavy camera/lens combo! Makes it very easy to lug around a lot of weight and have it always at the ready. I don’t have a 70-200mm VRII yet, but I’ve seen many people connect it to the lens tripod socket for a better balance. I’m using it with my D700, vertical shutter grip, and 24-70mm with an RRS L-plate. The only inconvenience is having to take the FastenR-3 connector off the L-plate to put the camera on a tripod. Since I don’t always use the tripod, this is not a big drawback. Aaron, that RS-7 R-strap looks really good…I will have to try it out, especially with the 70-200mm. A friend has the RS-7 with a Manfrotto plate that fits onto the strap screw, I am keen to try that out also. Do you think external flash is a necessary accessory to have? If yes I do hope you can give a little bit info, tip and tricks about it …. Farid, if you are shooting indoors or want to start shooting off-camera flash, then absolutely! I have not written many articles on flash photography yet, but hopefully will start doing it soon. Just want to share something, I had bought an off camera flash last week branded nissin Di622; it’s a third party product which suitable for my d3000. I’m really happy with the end result. The light spread evenly thought out the picture. I’ve took many pictures of my family especially my lovely daughter. I’m looking forward to use the remote system (basic using single flash) but still lack of knowledge (tips & tricks / positioning / best ways) in this. Do you have any suggestion or helpful links that I can refer to. Farid, I will soon start writing articles on flash photography, but need more time! You are most welcome Ansar! Thank you very much for the great information. I learned a lot. I just bought D7000 SLR with the kit lense (18-105). You suggested to buy a UV/Protection B+W filter. Can you please send me exact link for the filter suitable for my lense ?. Appreciated a lot for the info on your website. Venu, you are most welcome! Here is the link for the B+W MRC filter, 67mm. Thanks for link. I am wondering is it worth to spend $52 for the 18-105 lens (which costs about $300) ?. I am panning to buy 50mm f/1.4 prime lens in the near term. I am planning to spend on the filter for 50mm f/1.4 lens which is bit expensive. This is my first DSLR and serious about learning photography. My plan is to have one zoom lens and one prime lens to begin with my learning. Do you suggest i hold on to 18-105mm lens or sell it now and buy 18-200 VR II lens now or 18-105 is enough for some time for my learning ?. Venu, I don’t think you will get much improvement by switching to the 18-200mm VR II. The Nikon 50mm f/1.4G is a different story though – it would be a valuable investment for you. And don’t worry about the filter for your 18-105mm – I don’t think it is worth the money. I have recently entered professional photography and am currently specialising in maternity, newborns and children in my home studio. I have the Nikon D5000 and have purchased the AF-S 24-70mm lens and just recently the 50mm 1.4. My dilemma is that I am really concerned I am not getting the quality shots from the lens due to my DX camera. As you can see my largest investment has been my lens. Should my next investment be the D700? Thank you for your feedback Rachell and I apologize for a late response! If you are doing professional photography and shooting outside, then the Nikon D700 would certainly be a good investment and it would certainly make a difference, especially with your 24-70mm that will give you wider angles to work with. However, if you do not mind waiting, Nikon will be releasing an update to the D700 next summer, which will have better high ISO performance and resolution. This web site is so great ! Everything is so simply explained and easy to learn. Thanks for for your time. Expecting More . . .
Sain, you are most welcome! i just bought the new 50mm 1.4 and i also have the 18-105…Im planning o buy the uv filter that you recommend…Is it good to buy just the step up ring or my 18-105,so i can use the same uv filter?…i was browsing at b&h and it cost 52 bucks for the 105 filter…. MaiMai, get two separate filters for both lenses if the idea is to protect them. Step-up rings should only be used with specific filters like polarizing or neutral density – that way you don’t have to buy different size filters for each lens you own. Thanks for the brilliant website. I have bought a Nikon D3100 which has come with 18-55mm lens kit. Whilst most it is straight forward, Can you recommend which Lens filter, polarizing filter and hood i should buy, as there are too many options online. If you have any links on websites which ships to India, do provide so that I can buy it all from there. If you think there are any more further essential adds, let me know. Thanks million for your help. Love the article. I am interested in picking up a dslr. I currently have a Cannon Powershot G9 but have found it rather limited in low light. I realize it is just a point and shoot but expected much better pictures with it. I am leaning towards a full frame as from what I have read it seems this may work better in natural light situations (no flash) Any recommendations would be highly appreciated. Mark, switching from point and shoot to full frame DSLR is probably not a good idea. I would start with a cheap DSLR with a couple of good lenses to see if you will enjoy it. If you do and start to learn, then you should get a full-frame camera later. I am planning to buy the Blackrapid RS-5. I am just worried about the screw hole getting lose or broken due to the weight of the camera. I own a D7000 with some lens. I would really appreciate your feedback about this. I have the RS-7 with the optional BRAD mod and absolutely love it! I often use the D700, vertical shutter grip, L-plate, and 70-200mm f/2.8 VR II with it, sometimes with a 2x teleconverter as well, and I haven’t had any issues with the connector breaking, even with all that weight. No way I could carry it easy without that strap! I discovered if you slightly wet the connector before screwing it tight to the tripod socket it will hold longer without loosening. I’m in the habit of checking it now and then just to be sure it’s still tight though. I’m using the newer FastenR-3 and ConnectR-2, which I think all newer straps come with now, and they swivel freely and clip securely. The FastenR-3 also fits well in the palm when shooting verticals without a strap, has a rounded smooth surface in the palm without pinching like the previous one. Should work very well for your D7000 and most lenses! Nasim, I just recently bought my first dslr and was told to keep the uv protector on at all times. should I keep it on at all times or is just for outdoor use in sunlight? I have a Nikon d3100. 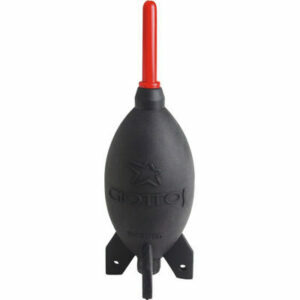 İ really like the rocket blower, it is must have for me, thta many times saved my life during shooting. Thankyou for this. I feel like I learned all this but then forgot it all again after a while. Most of the things on this list I need. Hi Nasim, I read that you said Hoya Pro series is better in filters. Can you please tell what are these linked below? are they worth buying? I don’t want to spend more 100s of dollars on that. Thanks for this wonderful site, it has loads and loads of information. I am planning to buy the Nikon D7000. However i am seriously confused on which lenses to buy. Do you have any special recommendations for lenses i should be buying with the D7000? Also i have always wanted to capture the night views of the city in detail, could u recommend me any lenses which would help me do this. Lastly any other suggestions from you would be great. I just bought my first DSLR -Nikon D 5100….and I am a beginner…. I found your website, especially photography tips for beginner very very useful for me. Thank you for your kindness to share your knowledge to others. GBU and your family always. Photography has been a hobby of mine for years and I have now decided to start building a portfolio to do it professionally. Mostly family portraits, maternity,senior pics, weddings etc…What is a good Starter DSLR and what lens would you say are a must starting out? Also, software for touch ups, any suggestions? Thank you so much!! I just drop in to say “Thank You”. I am a beginner and I own a Nikon D3200. Your tips for Beginners help me. Thanks again. I tried the blower inside the camera only once in my life and never again .. it blew dust up into my viewfinder compartment and I was never able to get rid of it till I sold the camera with a notice that it had dust up near your eyes .. has anybody else had the same experience before ? I have read presentations from others and learned to both respect and like your work. Thank you for your truly excellent site. Your presentations are always informative and educational. Your treatment of material is balanced and impersonal. Unlike other sites, your posts are devoid of pompous pretentions. You are the only site I would recommend! I know I will continue to learn from you. God bless you, Sir. Thank you so much! I read your articles all the time in my Photography I course. I have read that a dry cabinet is necessary to prevent fungus and I was wondering if this is necessary for when I get my first DSLR. I have a dehumidifier in my basement which states the humidity can be anywhere from 30 to 15%, but I was wondering if this is too dry. I plan on getting the WR Pentax K30 if that helps and shooting with it most days if that would shape your opinion. Any advice would be greatly appreciated! I am a beginner in photography and have purchased a Nikon D3100 and am currently using a 55-200mm lens. I have been using it for mostly sports photography as I have 4 active boys. Only using the automatic mode I seem to be taking some great photos. I would like to zoom in closer and have faster shutter speed. Can you help me with what is another lens I could use please. Sorry for sounding so green, but I will get there! thanks for your contributions. I really appreciate it as a real DSLR photo beginner. I have been using compact digital cameras for many years and a few months ago I decided to move to the next level and I bought my very fist DSRL Camera: the Canon EOS 600D. I have easy access to woodlands and wild life where I live and I am enjoying landscape photograhy. After a few months using the 18-55 lens, I feel I am missing some details that I could catch with a long-range zoom. Unfortunately, there are some many in the market and priced so differently that I cannot make up my mind. Would you recommend a 70-300 or 18-200 is just fine for landscape? Thanks again for your blog. Keep up the good job. PD. I invite everyone to share their thoughts about this. Thanks. Have been enjoying you website for a few months now. Good work! I recently got a backpack style bag for my gear. While I always keep my lenses capped, I’m back and forth about the value vs. inconvenience of keeping them in the soft draw string pouches they come with. My 70-200mm f2.8 zoom has a rather big zipper bag with its own strap. These pouches are are one more thing to hassle with when I want to get a shot, but then there is some comfort knowing the bags could be of some protection value. I’d prefer to leave the pouches and cases at home when the lenses are nestled in the pack. What are the best practices here? Thanks Nasim, for this stater kit.The information presented is very sensible. Will be on the lookout for the things you mention next time I am out shopping for the camera. I have D5200 with a Nikon provided small bag having space for two lenses. I’d be careful about getting a big backpack as your first buy. I made that mistake years ago. Got myself brand new d70 (yes, that long time ago) several lenses, filters and massive Tamrac Expedition 5 to carry it all… and ended up leaving the camera at home most of the time, it was just too big and too heavy. PS. Just discovered your website. Looks really nice. I just discovered your blog so I am playing catch up. I am new to photography and just got a Canon Rebel T5i. Can you recommend a good (quality and price) Lens UV/Protection Filter for me? I just want it as protection and not any kind of actually filter setting. Iam a Canon 60d user. Sir more intrested in macro photography. As iam doing research on organisms of about or below 2 cm. I really get problem with shooting these organisms. Sir I have 18-55 mm and 50 mm prime lense. Plz suggest me in this direction and some tips. Hi I have a Nikon D5100, I bought an assortment of accessories which included a Nikon AF 50mm 1:1.8D—is this used mostly for portraits? inside? someone recommended I buy a 35mm—is the 50mm do just as good a job? hello,i just bought a brand new d7100 and i want to put some filters on it..my question is a polarize filter is good for protection too or i need to buy more?does nd filters swrew on the other ones?like polarize ,uv etc,thanks alot! You have a lot of great pointers on this site! I own a Nikon D7000 and am looking at what lenses would work the best for an inside studio that is about 16’6″ x 11’6″ with a height of 8′. I already have 2 lenses but they don’t seem to be appropriate for inside a small studio room. I have one that is a 70-300 and the other is a 28-80. I don’t know off hand the rest of the information on them as I don’t have them with me right now. Could you please advise what lenses would be more appropriate for this situation and what would you suggest in the line of lighting for this size of a room. I am currently looking into the umbrella lights with reflectors but not sure if that is my best choice. I read your website and can’t just close the tab without complimenting about this website. It’s of great help. To be frank, I’m not a photographer and was searching about stuffs that can be gifted to a photographer brother. Yet, the way have documented the stuffs are excellent. I need your help in gifting my brother. I’m thinking of gifting a tripod. he already has one which is a basic tripod which can just hold the camera. Can you please just some good tripods which have connections for remote controls also. Sorry to bother you for this. I am having a 55 – 250 mm lens and scratch is there on it. How to get off that scratch ? Will there be any help if i use lens cleaning kit ??? FYI: MarkinsAmerica.com has D500 L-Brackets in stock for $129.99. A clever two-piece design. I own Markins Ballhead and gimbil and the quality is incredible. I’ve not posted to this forum before so I hope this is appropriate? I’m new to the DSLR world and recently just got used Nikon d90. I’m so happy I discovered this website, it has a wealth of information, and I’ve been spending hours taking notes on here. Thank you! I’ve just bought my first dslr camera ever, Nikon 3400 with 2 lenses. I want to keep the lenses clean and protect them. I’ve bought a sturdy shoulder bag, and I’ve read what you said about UV filters. Are there any pros/ cons with UV filters? I’ve read an article, where they were not so keen on UV filter but it seems they got some cheap ones and so they’re negative about it. They talk about some distortion in pictures, but I don’t understand their point. Do you see any advantages/disadvantages? Are the any differences in price/quality etc. Is there something else I can do to protect the items! NB. You’ve an great website! I enjoy it so much! Is it important to buy a UV Filter…?